I have quite a few areas left to work on. The upper front garden, as I mentioned in my last post, is not done, but this is the one I focused on next, the blueberry bush garden which is on the south side and gets the most sun of all the gardens. I took this picture late in the day. I can only work in this garden early in the morning or late in the day to avoid sunburns and the heat. You can see I have the back stuff under the mulch that helps keeps the weeds under control, but nature finds a way, if you turn your back on it! Actually, nearly all the garden areas looked similar to this until I worked them, I was just too ashamed to even take the pictures to show the transformation. I decided that I should show at a least one...but it still makes me cringe. This garden has been edged with a variegated liriope that is the spreading rather than clumping type, which means that it spreads just like the grass that has infiltrated it. Such a messy garden! I decided to take it all out and maybe edge with a clumping liriope, separating the plants I have on hand in hopes that they will tolerate the sunlight. Now in the next picture below, you will see, at the front of this garden, the stump of a ornamental cherry tree that we cut down because it was diseased. We used several treatments to kill the stump and roots, but as diseased as it was, the thing took years to completely die. After it finally did, fire ants decided that they would like to make a home around it. I would get rid of one batch and another would move in! So, there the fire-ant-wooing stump sat in the garden that was larger than I needed it to be and I would like to make smaller with the edge going right where the stump was and I decided enough was enough with the ants--I needed to remove the stump! 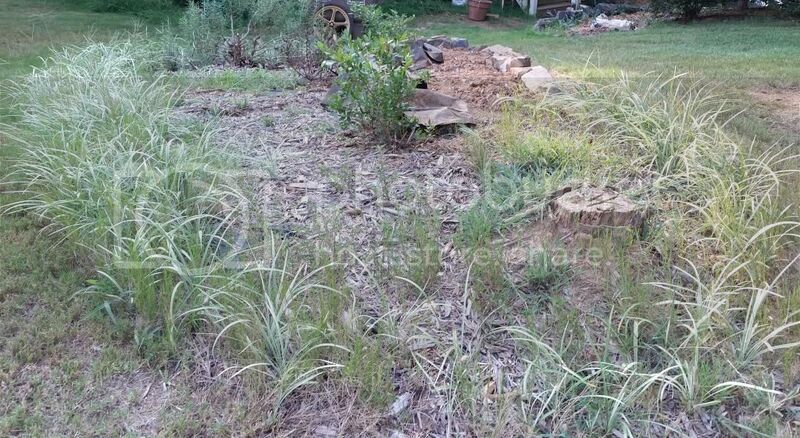 I treated the ant hill and I talked about the stump with my husband the night before. He had been doing his own projects and so the gardening has been mine alone, even the Princess would not work in the heat. The next morning, it was cloudy and a bit cooler, and the ant hill was dead. My husband was working on the van because it was making a strange sound he could not find (which took most of the day for the mechanic to find the source but only ended up costing us a bit over $300 thankfully), so when I came outside to work in the garden and found the axe stuck in the stump, I thought he put it there for me to use...but my Prince Charming saw me pitifully hacking away and yelled, "That's not for you. Do you want to be able to go tubing tomorrow?" Okay, so why was it left there all by itself? (By the way, our friends changed the tubing trip to a swimming one at a park because of a church meeting and public school starting the next day, but we took our new tubes bought at a close-out store with us.) May I say that my husband is impressive when he is using an axe! The stump was out in less than 30 minutes. On my part, I first dug out about a third of liriope stuffed their bareroots in four plastic pots with a sign "Free Plants" by the road. Someone did take them. Good luck with them, I say. I still had more than I could ever want, but I am thankful for when I planted them, I only had a few and separated them a few times to fill in. They tolerated the four-year drought and poor soil when I lost so many plants, but at this point I have tired of their meandering ways and friendliness with the grass and weeds. What is it with grass, anyway? It grows where you don't want it and doesn't grow where you do. 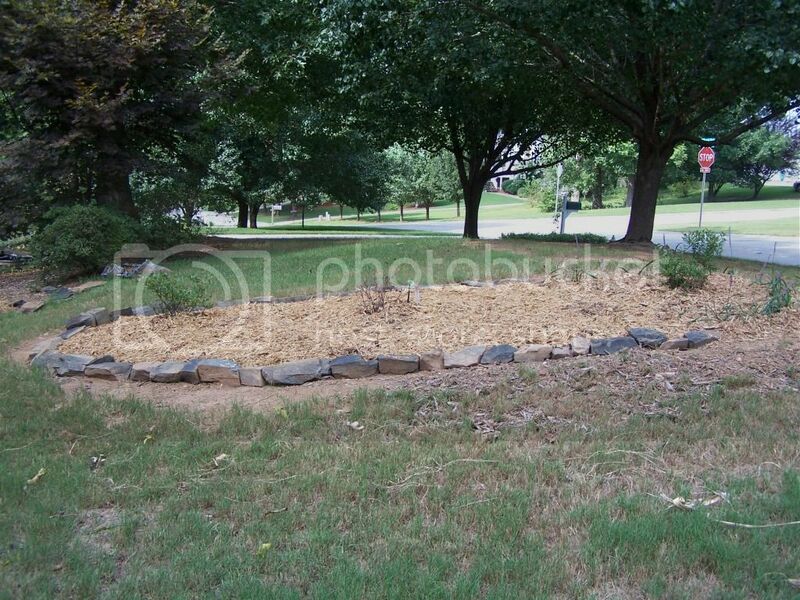 This garden has a rock edging, but not enough to go all the way around, which is one of the reasons I wanted to make it smaller, so that meant I would have to move all the rock edging. I found grass had forged its way not just between the rocks but under them also, but then so had the liriope in the opposite direction. To avoid using chemicals, I ended up taking apart the entire garden, digging up all the roots under the old black sheeting, removing a rosemary bush that I never really liked there, laying down new black sheeting, and refitting the rocks with black sheets with an extra line of black sheeting under them also. If you have ever done a rock edge like this one, so that the rocks fit together with the smallest of gaps, you know what a job it is. It took me several mornings to do just this one patch of ground and the weather was particularly hot during this time even in the early morning. Still ugly in the above picture, but now weed and grass free! I got all the rocks how I wanted them, but there is still a gap in the front as I knew there would be, so I had a plan. 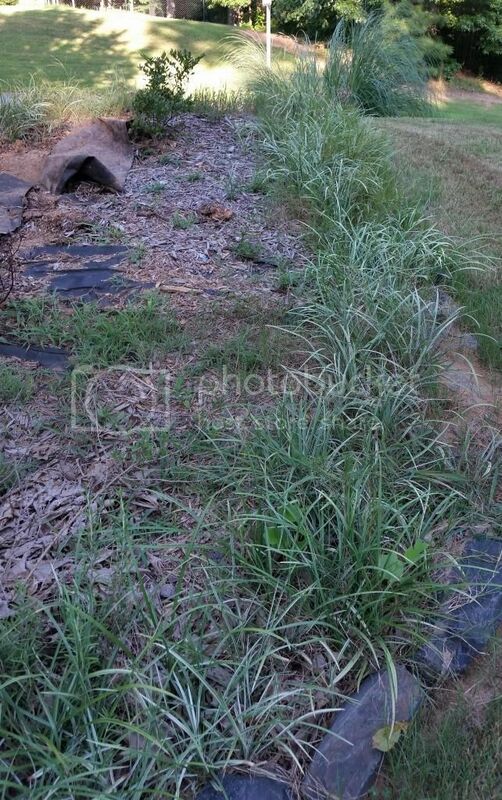 I divided and planted some of the liriope that clumps and makes a nice border as a test to see if they can take the sun, before I edge the entire garden area with them. The garden bed is a bit smaller, using less mulch, looking a bit sparse with just three blueberry bushes currently--well, the jury is still out about the middle one making it. I have also used this garden for planting watermelons and pumpkins as it does not bother me if the vines over flow but this year I knew I had to rework the entire thing so I did not plant any vines. So I have done about all I am going to do with the gardens for now...maybe...well, there is always something to do and I want to finish planting the liriope edging behind the rocks on the garden on the left in this picture, but I had to wait until today because I treated yet another fire ant hill and I should be able to work the area now. Then I need switch gears. I already put some clothing in our first consignment sale which I will be picking up the leftovers today and listing what is left for the next one this week. I am going to be consignment sale shopping one day this week with my friend and her daughter's former teacher, a fellow church member who has taken the year off for maternity purposes. I also need to begin planning our homeschool curriculum and I do have some other things I am excited about that I will be posting here soon.